(Lindenwold, NJ) – This week’s heavy rains and wind gusts have delayed the start of structural work on two bridges that pass over the Cooper River. The Freeholder Board’s Department of Public Works anticipates beginning construction on both the Grove Street and Cuthbert Boulevard bridges on July 26. To facilitate the construction, detours will be in place. The exact timing and completion of both projects may be altered by weather and other factors. Due to the locations of the repairs, varying traffic control measures will be implemented at the two bridges. At Grove Street, traffic will not be permitted to travel northbound, from Haddonfield Borough toward Route 70, over the bridge for the duration of the project. A detour will be implemented at Kings Highway and will take traffic around the work zone on Park Boulevard. Southbound traffic, from Route 70 toward Haddonfield, will remain open for the duration of the project and will not be impeded by construction activities. Pedestrian access will be maintained over both spans during the construction process. During peak travel times, local police departments will manually control traffic signals for the one-way detour at the intersections of Kings Highway and Park Boulevard and Park Boulevard and Grove Street to mitigate delays. 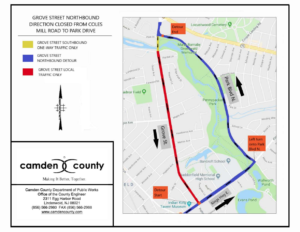 Regarding the superstructure work over the Cuthbert Boulevard Bridge in Haddon Township, crews will maintain a single lane of traffic in both directions. The contractor will close the left lane in both directions on the bridge during construction, however the right lane, in both directions, will remain open for the duration of the project. The $1 million projects funded by the state Department of Transportation Local Bridge Future Needs fund will include strengthening of the weakened beams by the addition of steel angles, steel plate, and steel channels to the webs and flanges of the affected beams as specified by the engineer. The work shall include traffic control and maintenance, cleaning and painting of steel, and the installation of reinforced concrete diaphragms. Joe Ragusa, overseeing the construction management of both operations, can answer any questions the public may have about the projects. He can be reached at (609) 828-3222 or by email at joseph.ragusa@rve.com. The Camden County Department of Public Works is responsible for maintaining 1,400 lane miles of county roadway and 61major bridges. To report concerns on Camden County roadways, call (856) 566-2980 or visit www.camdencounty.com.